The growing demand for "own voices" storytellers has pleased me greatly. Mostly because many stories told by outsiders tend toward being inaccurate or downright stereotypical. It's hard to get things just right when one isn't part of the culture being shared. So when Debbie Reese of the American Indians in Children's Literature recommended this book, I couldn't wait to get my hands on it. And I'm quite pleased with it. 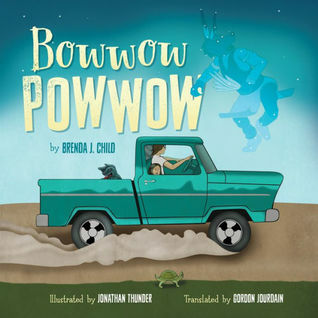 The story revolves around a young girl's experience with her Ojibwe cultural tradition of attending a powwow. I could easily feel the girl's enjoyment and the excitement of the event as well as the unusual nature of her dreams. While the illustrator's style wasn't quite to my taste, I can't find fault with the bright, appealing colors and the depictions of traditional clothing and dancing. References to both past and present show how life has changed for Native/First Nations peoples. This makes for a great addition to most collections, especially with such a dearth of Native/First Nations own stories. 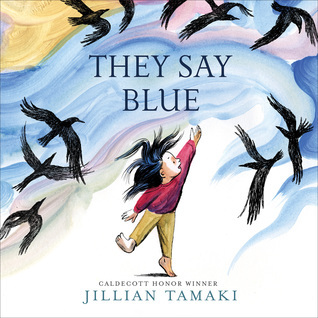 Caldecott and Printz Honor-winning illustrator Jillian Tamaki brings us a poetic exploration of color and nature from a young child’s point of view. They Say Blue follows a young girl as she contemplates colors in the known and the unknown, in the immediate world and the world beyond what she can see. The sea looks blue, yet water cupped in her hands is as clear as glass. Is a blue whale blue? She doesn’t know — she hasn’t seen one. Stunningly beautiful illustrations flow from one spread to the next, as time passes and the imagination takes hold. The world is full of color, and mystery too, in this first picture book from a highly acclaimed artist. This most unusual book of colors is full of imagination and beauty. A young girl looks at the colors in the world around her and how they change. She also sees colors and imagines what else they might be, such as a field of glass that looks like a golden ocean. But like life, the girl faces disappointment when a storm comes along and makes the world seem dreary and lacking in color. But like the hope of youth, color springs anew in the form of a purple crocus. This gorgeous book is full of imagination and comparisons and new ways of seeing things. This book would be a fun one to share with a child just to see what they might make of it that an adult would not. A joyful celebration of the hope and fresh eyes of youth.